2.25x10 Wicker Antique Brass Floor Register Discounts Apply ! These wicker antique brass floor registers will give your floors the finished look you have been searching for in your home. 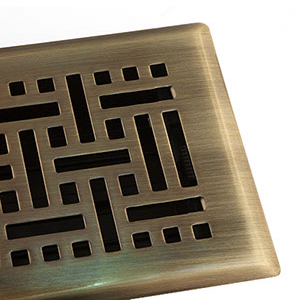 The finely crafted metal vent covers are tarnish and corrosion resistant, allowing for easy maintenance. Our antique brass floor registers are sturdy and durable metal vent covers that are made to hold up to 200 pounds. These antique brass floor registers include an adjustable damper made of high temperature ABS Resin plastic which is rust proof. 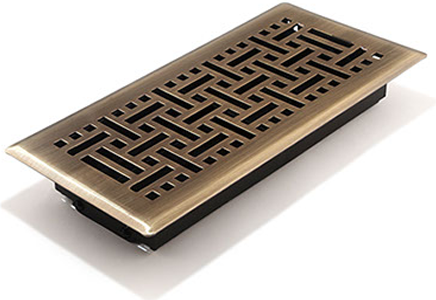 Simple, yet tasteful, this 2.25 x 10 inch metal vent cover will be an eye catching addition to your home. ***Hint: The industry standard is to purchase the metal vent cover using the actual hole opening size and not the faceplate size. These antique brass floor registers will fit a 2.25 x 10 inch hole opening. Wicker metal vent covers come in other sizes and other colors. These antique brass floor registers will compliment any style, so buy yours today!